Probably, Marcy Foldable Exercise Bike NS-652 is the cheapest exercise bike that you can find on the market. Despite the low cost, this bike provides you with full workout potential, giving you the motivation to achieve your fitness goals – either rehabilitation/physical therapy or musculoskeletal training. There won’t be any excuses like “I do not have time for exercise”, “I don’t know how to exercise”, “Exercise is so boring”, there will only the commitment to exercise. Because health is the most important thing, get yourself the best equipment that can inspire you to practice right now. Let me introduce you the Marcy NS-652. Marcy is the key brand of Impex-fitness. Since being established in 1982 as a manufacturer of fitness products, Impex has been developing sustainably and is now the leading health and fitness equipment provider. Impex products are well-known for its innovation, superiority and competitive price, as well as the great customer service. Impex is the main vendor of many big sporting good retailers and fitnesses with its wide-range of products and brands. Besides Marcy, Impex has some more popular brand including Competitor, Apex and Hers. Each brand is positioned in one specific market segment of the sports equipment industry, and Marcy is specialized in home fitness equipment. Marcy provides various home health and fitness equipment, including home gyms equipment, strength enhancing equipment, cardio exercise equipment, fitness accessories, outdoor furniture and kids playground. 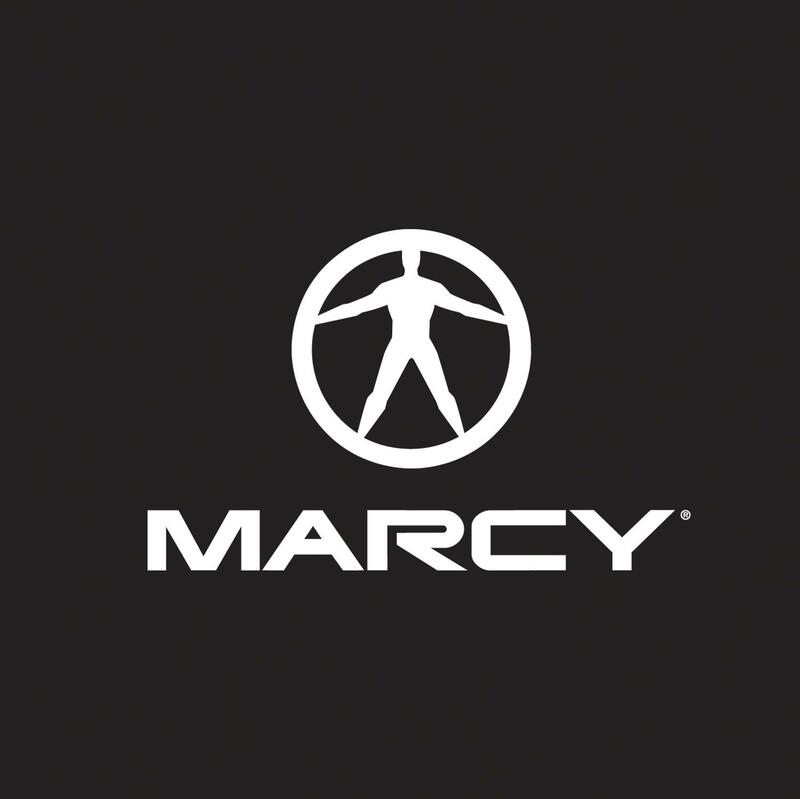 Overall, Marcy is a Worldwide-trusted brand. Marcy Foldable Exercise Bike NS-652 is a hybrid bike. It somewhat between a recumbent exercise bike and an upright exercise bike, which is great for improving your cardiovascular and musculoskeletal health. Marcy NS-652 is upright with a high seat and has two handlebars forward, which is like a real bike. This design gives you an outdoor recycling feeling which is interesting and challenging enough to stimulate your inspiration, and you might work out for hours without notice. An upright bike is designed for serious training. 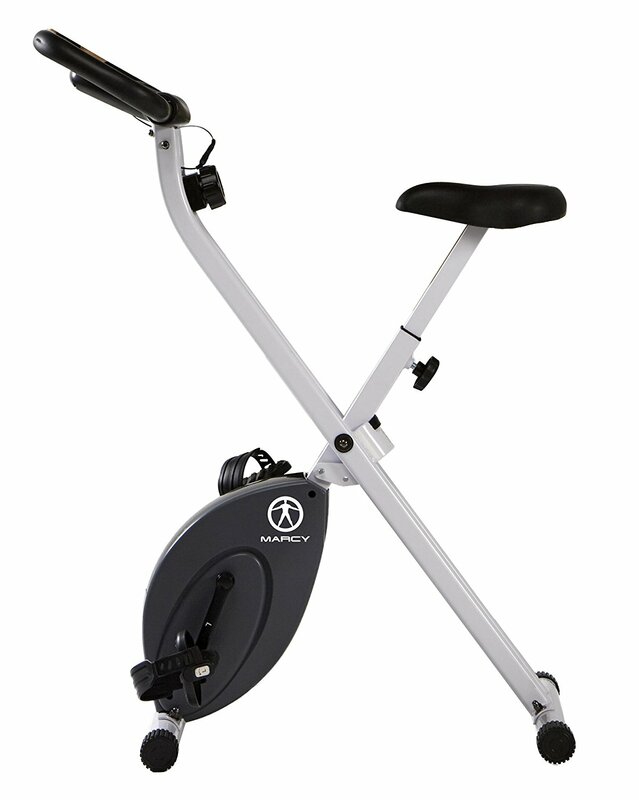 However, Marcy NS-652 is a little different from a traditional upright bike as it has the pedals designed a bit forward. This makes the bike more like a recumbent bike, and provide you with more comfort, but in exchange, its exercises will be less intense. – This is the most compact exercise bike that I’ve ever seen. Marcy NS-652 is designed for small apartments or small rooms. Indeed, its dimensions are 32 x 18.2 x 42.2 inches (81.28 x 46.23 x 107.19 centimeters) and its weight is 39.5 pounds (17.92 kilograms). When it arrives, it comes unassembled, thus you need to assemble it by yourself, however, it’s very easy. The bike support up to 250 lbs and 5’5 inch to 6’2 inch users. – Marcy NS-652 has the folding capacity, and transportation wheels, so you can move this bike easily and can store it when not using. – The bike has a simple design and also a simple way of use. You just need to climb on the bike and pedal. – The build quality is good with excellent materials for the most parts. The bike is solid and will stay firmly and sturdily when you are cycling. – Marcy NS-652 uses a magnetic resistance mechanism to provide a quiet and smooth operation. Your workout will not interrupt movie watching or music enjoying. 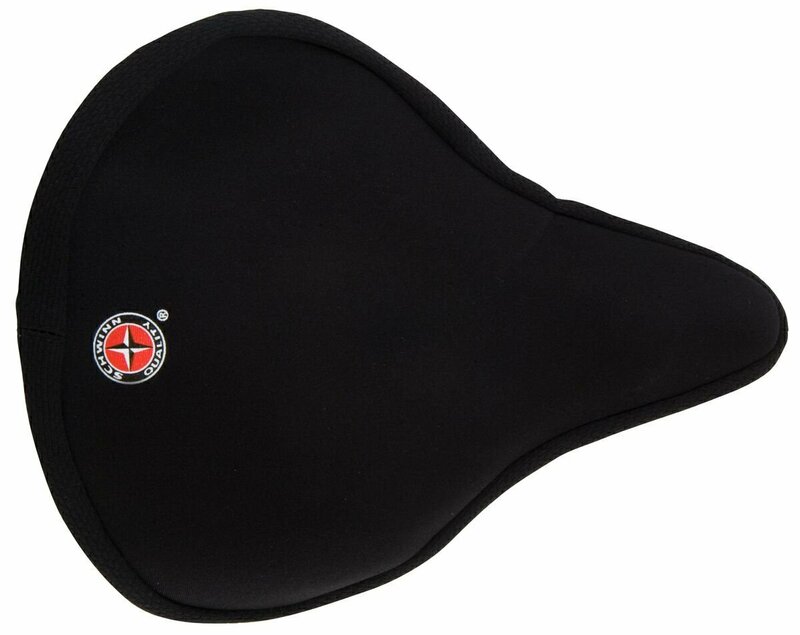 – The seat is hard and uncomfortable, making you have to purchase an additional cruiser bike seat pad. – It’s hybrid bike, so it’s not as comfortable as a recumbent bike, and not as serious as an upright bike. In addition, its pedalling movement is quite awkward. 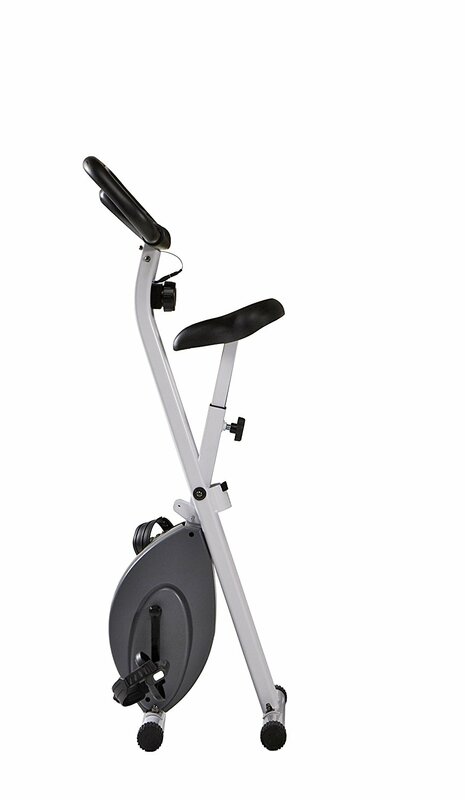 Marcy Foldable Exercise Bike NS-652 has a nice appearance with scratch-resistant, powder-coated white finish. The bike’s main frame is made of 14 gauge top quality steel. Together, they make the bike durable and long-lasting. The x-frame design, together with two front and rear bars, makes the bike stand firm and hold you steady without any rocking or the feeling that it might tip you off. And this design makes it is very easy to get on and off the bike. This exercise bike is uniquely designed to save space. It’s compact and foldability allows easier storage and portability, granting you more area at home. So, the bike is especially useful when space is limited at home. Although Marcy NS-652 is not equipped with transport wheels, it has rubberized foot bases to prevent scratching as you drag it across a room. However, there is a drawback since it doesn’t have levellers, thus, you need to stand it on a level ground. 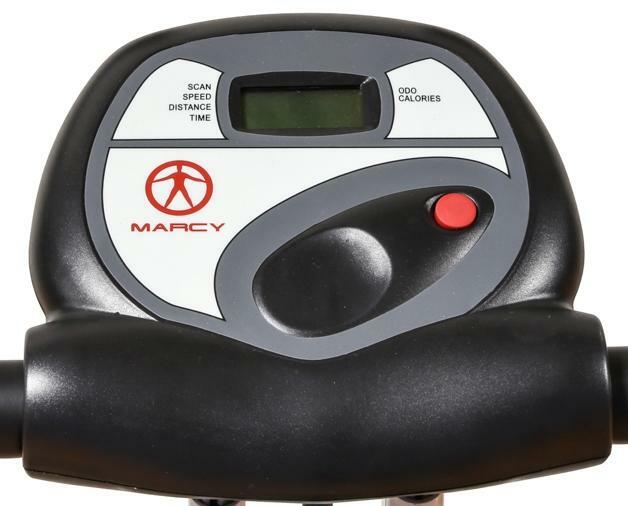 Using a magnetic resistance mechanism, Marcy NS-652 provides you with 8 levels of resistance that can easily adjust for an easier or more difficult workout. All you need is to turn the knob in front you. To increase the tension, turn the knob in a clockwise direction. To decrease the tension, turn the knob in a counterclockwise direction. It’s fair to say that the seat design is not good. The lowest setting is still too high for many users, I wonder why they designed it so high. So, those shorter than 5’5 inches might won’t be able to use this bike comfortably. The bike has a knob to adjust the height of the seat for even taller users. The seat is designed like a real bike seat. And it’s awful. Sorry to say that, but it is really hard. This is an indoor exercise bike, they could have made it softer. So, you might need an additional Cruiser Gel Seat Cover – it’s a lot more comfortable. 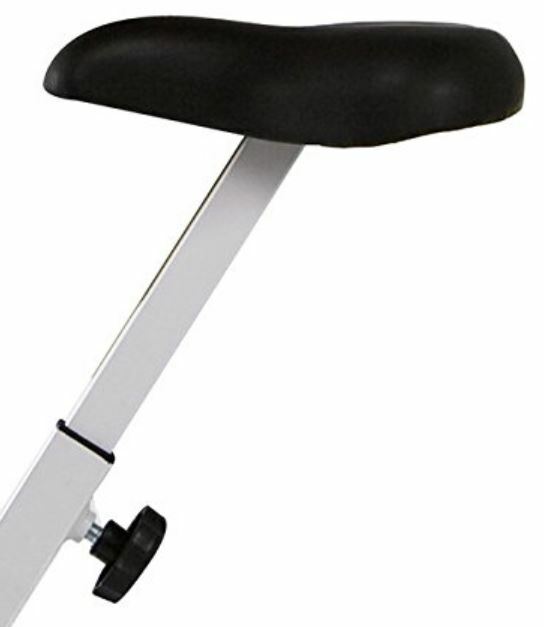 Marcy NS-652 doesn’t have a backrest because your body might be forward and downward while workout. But to do that, you need to be high enough, thus, this can be considered as a weakness. Marcy NS-652 has two handlebars in front of you. This design is specialized for intense workouts – your body will be forward and down at an angle while you are holding the bars, creating a dynamic posture that allows you to pedal fast and strong. Handle bars are not integrated with Hand Pulse Sensors for monitoring heart rate. It is so sad because measuring your pulse rate is important for exercising correctly and efficiently. But you know, we can’t have too much at this really good price. Marcy NS-652 has counter-weighted pedals with adjustable foot straps in front of you. 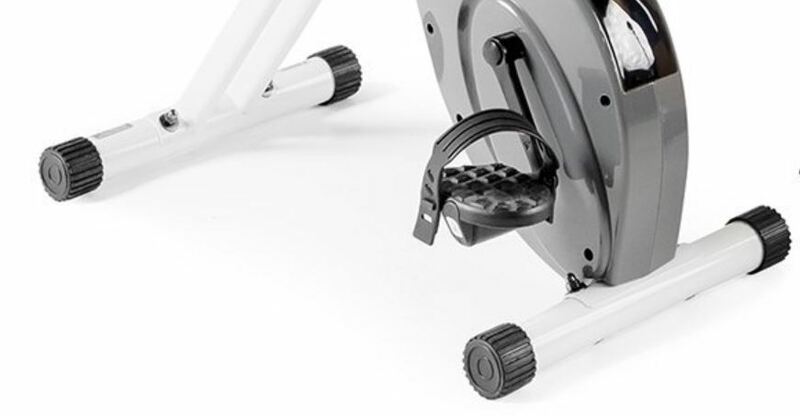 Larger pedal design with safety strap prevents any foot slippage when exercising, giving you proper alignment for efficient pedalling with ultimate control. They are also quiet, so you can enjoy watching movies or listening to music while exercising. However, the material of these straps is plastic, which might make your foot hurt if you pedal by your bare feet. And normally, the foot straps will not stand for more than one year and need to be replaced, if your workouts are hard. Marcy NS-652 is equipped with an LCD display in front of you, which gives you the ability to track your workout progress. You can monitor speed, distance, time, and calories burned to start setting those daily goals. There’s only one button, and it’s super simple to use the display. That’s all about the design. So simple and basic, right? That’s why this bike is so cheap. With that simple design, whether it provides you with good pedalling feeling and fitness efficiency? Let’s find out. The simple operation that keeps you focusing on pedalling and achieve your fitness goals. Proper sitting posture helps you practice effectively. Strong build provides firm pedalling felling. Magnetic resistance mechanism gives you smooth and quiet operation. No noise, little heat and no dust. The seating position does not fully support your body. When you are exercising, your body will be forward and as downward as fast your pedalling is. Your both hands will grasp the front handlebars. Your legs will be forward to reach the pedals – the only thing makes your posture different from the bicycle riding posture. This posture allows you to put more effort to pedal fast, which is great for weight loss and muscle training, while still support your hip, knees and ankles. There is no backrest, so your back will not be supported, neither your shoulder is supported. You should lower your upper body in order not to get tired back too soon. This posture can support both easy exercises for rehabilitation/physical therapy treatment and hard exercises for musculoskeletal training, which is hybrid and not inclined to any kind of workout. Marcy NS-652 has a precision balanced flywheel to create resistance and momentum, thus, when you start pedalling, your first several rotations are quite hard. And it gets easier and smoother after every rotation, even, you will need to produce a force to slow down the speed. This is the special positive function that makes riding an exercise bike different from riding a real bike – It will not do harms to your joints and make the workout more rhythmic and interesting. To create the resistance, Marcy NS-652 uses a Magnetic resistance mechanism. This system uses electromagnetic induction to provide the resistance, making the operation smooth and quiet. This smooth allows the bike not to cause problems for people with joint issues. In fact, many people with injured knees have used the bike for rehabilitation or general fitness and have got good results. 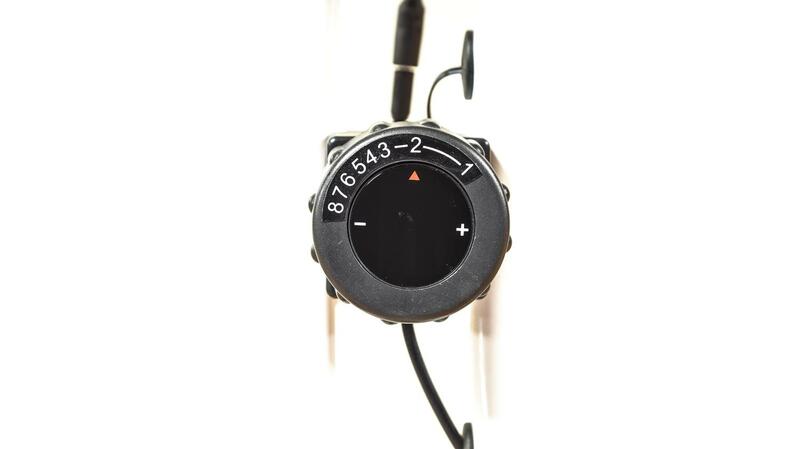 Furthermore, you can easily adjust the level of resistance at a push of a button. There are 8 levels of tension resistance, so you can turn the knob to increase or decrease the tension. In the hardest resistance level, the bike is great for training your muscles and lose weight. And in easiest resistance levels, the bike is great for rehabilitation and general fitness. The components of a Magnetic resistance mechanism also have a longer life than other kinds of resistance mechanism. You don’t have to be worried about replacing them, which will lower your cost. The solid frame and sturdy design give you a firm feeling during your workouts. There won’t be any shaking or creak, making the pedal experience really good. Dust: The design of Marcy NS-652 is really simple, so you do not need to worry about dust and dirt. And if the bike is dirty, you can easily clean it with a washcloth and clean water. After the workout, you can fold it up and wheel it to where you want to store it. Its lightweight and foldability are made for this. However, you will need 2 AAA batteries for the console. 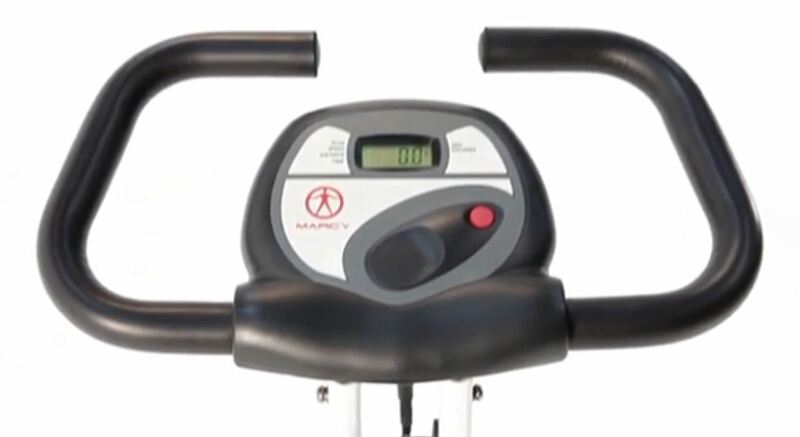 Marcy NS-652 costs only about one hundred dollars, which makes it the best price exercise bike on the market. More important thing is that the bike has a good quality. It’s such a good deal. Marcy NS-652 has limited warranty that it will be free from defects in workmanship and material, under normal use and service conditions, for a period of two years on the Frame from the date of purchase. The warranty is only applied to the original purchaser and is not applied if the damage is caused by or attributable to freight damage, abuse, misuse, improper or abnormal usage or repairs not provided by an IMPEX authorized service centre. In warranty protected time, any defects will be fixed or replaced free. Marcy NS-652 has a high Amazon product’s star ratings. This index uses an AI model instead of the simple average indicator to give customers better information. In particular, it considers the factors like the time of reviews, helpfulness votes by customers and whether the reviews are from verified purchases, to calculate the final score. – Can you stand and pedal at the same time? The answer is no. The build is sturdy but the design makes that very uncomfortable. – The suitable height and weight? Many commented that they are 5’2″ and cannot ride the bike, so you need to consider this really careful. And the answer for the maximum weight is 250 lbs. 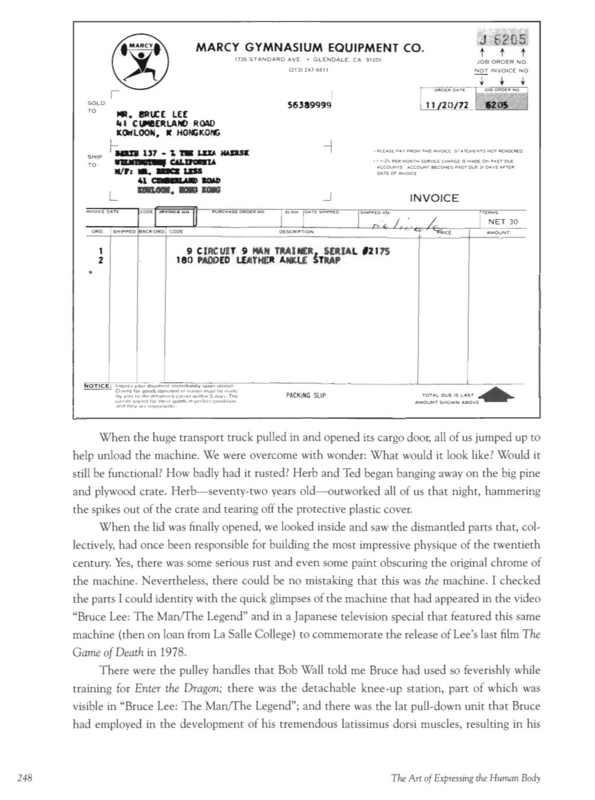 – The dimensions when folded up? 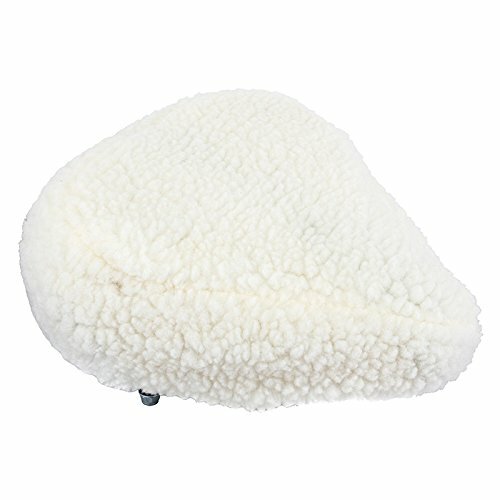 In the customer reviews section, there are a lot of positive comments, most of them relative to the quality of the paid price, its silent, its compact, its durability, and its foldability. There are also those commented that they had injured knees, but could use the bike without any hurt. In addition, the unbox and assembly section when the bike first arrives is simple. Averagely, it only took them about 30 minutes to put the bike together as a great deal of the assembly is done before unboxing. Of course, there are negative comments. Most complained that the bike is too high to them and the seat is too hard for comfort – and most of them need to buy a $19 additional seat cover. Some say the bike starts making clicking and whirring sounds after a few weeks of usage. Some even say that the speedometer stopped working completely after a month of usage. And some other malfunctions. However, these mistakes belong to the manufacturer, so you can have the replacements. Despite some drawbacks, overall, this is still a good exercise bike at $130. If you want to purchase a more expensive bike that comes along with a high quality – I will recommend some below. In conclusion, Marcy NS-652 is really a good budget bike that is super space-saving and sturdy. By committing to exercise using this bike, surely you can improve your general health and stay fit. It is also good for physical rehabilitation/physical therapy treatment. However, the features of Marcy NS-652 are really basic and there are some disadvantages mentioned above, if you want a more advanced bike, you can check my recommendations below.